The overall health in Sarasota Bay remained high in 2015, changing only very slightly from the previous year. Chlorophyll a and phosphorus showed very small increases, and nitrogen decreased. Water Quality: All three water quality indicators (chlorophyll a, nitrogen, and phosphorus) were rated as excellent (below their respective targets). The mean for chlorophyll a was calculated as an arithmetic mean and the means for nitrogen and phosphorus were calculated as geometric means (per the Numeric Nutrient Criteria outlined in the Florida Administrative Code, section 62-302.532). Mean chlorophyll a concentration was 0.0046 mg/l, below the target value of 0.0052 mg/l. The mean concentration of total nitrogen decreased slightly to 0.3873 mg/l, still below its target value of 0.490 mg/l calculated in 2010*. Mean total phosphorus concentration increased marginally, but at 0.0602 mg/l was still well below its target value of 0.150 mg/l. Biotic Indicator: A survey of the biotic indicator, seagrass, was performed in 2014 by the Southwest Florida Water Management District. In 2014, the total area of seagrass in the lower portion of Sarasota Bay (the area within Sarasota County) was estimated to be 3,397 acres. 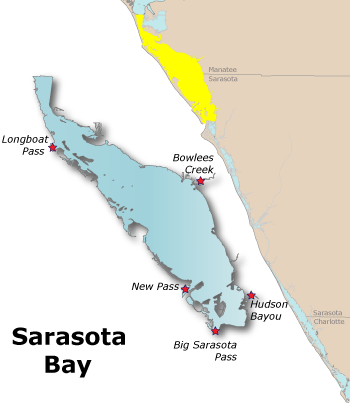 The total for the whole of Sarasota Bay was estimated to be 10,261 acres, well above the target of 7,269 acres. *A new target value for nitrogen has not been defined for Sarasota Bay because insufficient color data exist to perform the necessary calculation.